US, 1990, 93 minutes, Colour. Eddie Murphy, Nick Nolte, Kevin Tighe, Brion James. Another 48 Hours is a reworking of the original. 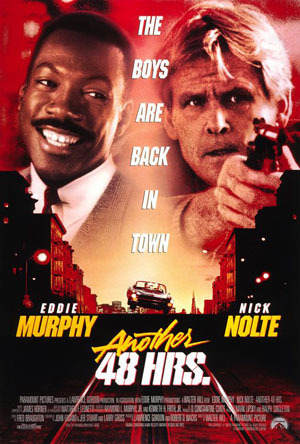 48 Hours was tough entertainment, capitalising on the contrast between bullish Nick Nolte and street smart Eddie Murphy in his first film. Now Eddie Murphy productions gets Murphy top billing - but he is surprisingly restrained (in comparison with his previous film, Harlem Nights). But the film is not restrained. A standard plot is given loathsome villains, brutish violence stunts and smash-ups galore that is more ugly than enjoyable. Direction, as for the original, is by Walter Hill who has a speciality for this kind of action drama (Streetfighter, Southern Comfort, Red Heat). While there is humour, it still seems to be mayhem for mayhem's sake. 1. Entertaining police thriller? Comedy? A violent America and brutal American? 2. The title, the success of the original, a reworking of the original's plot? Continuity of characters and plot? Capitalising on the popularity of Eddie Murphy? Nick Nolte? 3. San Francisco and California locations - the desert, the countryside, the city and its streets, the Panhandle and its sleaziness? Apartments? Authentic atmosphere? The importance of so many stunts and special effects? Overall impact? Music, songs? 4. The focus on the desert, the bikies, their brutality and violence at the opening? Police pursuit? The murder of the police? The pursuit with Reggie Hammond? Shooting, the overturning of the bus? Their going into San Francisco, the contract to kill Reggie? Their code, death of the brother, Mr Price and his contract? Ugly behaviour, brutal in the bars, with Angel? The final confrontation in the block of apartments, the shoot-out? Going to the Cage, the further shoot-out and deaths? Ugly villains? 5. Jack Kates, his work in San Francisco, his pursuit of the Iceman? Wilson and his scepticism? Kate's shooting - and internal investigations? The hearing with Wilson? The reaction of Kehoe and Cruise? Friends? Processing information? Going to prison to see Reggie, commandeering his help? His being shot at - and the bullet proof vest? The deals with Reggie? Their banter, double deals, fights in the bar? Their pursuit of Angel? On the track of the killers, the block of apartments, the shoot-out? Kates and his continually getting information from Kehoe, processing it? His final suspicions? The information about the dead black dealer? His going to the Cage, the shoot-out? His future? The jokes, with Reggie? Portrait of a San Francisco cop? 6. Eddie Murphy reprising his role as Reggie Hammond? More restrained in comedy and language than in the original? (Criticisms that he is more contrived and plastic?) In the prison, the contact in prison and the information? Getting out, the visit from Jack? Ignoring him? The fight between the two, in the bus, the shots, rollover? With Jack, the recovery of his car and its explosion? The money in the police precinct? His life under threat? Accompanying Jack on the investigations - to the bar, the fight, with Angel, the apartment and the shoot-out? The visit to the prison to get detailed information? Giving the money to the prisoners daughter? His being taken as hostage? The Cage and the final shoot-out? The ironic humour at the end - and the money deal? 7. Kehoe, the San Francisco cop, the buddy, his support of Jack? The revelation that he was the villain? The final confrontation? Reggie and his identification of the Iceman - not Wilson in the courtroom, not Cruise at the Cage? Cruise and his police work, audience suspicions, vindicated? 8. Wilson, smooth tone, internal affairs, criticisms of Kates, confrontations and fights, in the hearing? Kates thinking he was Iceman? 9. Reggie's prisoner friend, support in prison, his giving information to Reggie and Kates (brother talk)? His daughter and the money, her being taken as hostage? 10. Angel, dancer, contact with the criminals? The shoot-out? 11. The black go-between, setting up contracts? In the bar? Sinister, a murderer? His being shot by the Iceman? 12. Price and Ganz and the ugly world of drugs, murder? Arbitrary violence? Weapons and the use of the weapons? Chases, shots and explosions? 13. The popularity of this kind of film in the 80s? The popularity of the original and this as an explosive but unimaginative replay?